These are random images from my 10-volume set of the original Trial Transcript as transcribed from shorthand taken by Frank Burt’s stenographers in the court room and passed on to the typists in back of the New Bedford Superior Court in 1893. This is what allowed national papers to transmit over wires all over the country to the public awaiting the next edition of their home town papers. Each volume includes the index and image(s) I created/assembled that were reflective of the of testimony included for that specific volume. How I acquired these and produced them for sale on eBay (a couple decades ago) is explained in the first image above. I have used these volumes countless times when fact-checking various published works on the Borden case and Superior Court Trial. I’ve referred to them most recently with Cara Robertson’s book, The Trial of Lizzie Borden to be released for sale in less than 2 weeks. I have always relished in the thrill of reading the actual transcripts exactly as they were typed and made available to reporters in just a matter of hours from when the testimonies were actually given. The testimony comes alive, putting you in the court room itself (something, by the way, which Cara’s book does), so much more than reading the contemporary digital recreations into a WORD or .pdf document more than a century later. So enjoy, and to borrow from today’s vernacular – “let’s keep it real”. Time to revisit Maplecrof – Lizzie Borden’s home for the entire second half of her life. She had great pride in this house which she nurtured, maintained, and coveted as if it were the child she never had. House was purchased on November 21, 2014 by Twilight Enterprises (actually Howard and Kristee). While its been written and often stated that Lizzie and her sister moved into a mansion on The Hill, the Charles M. Allen house was not a mansion. Newport had mansions – Fall River had stately Victorian homes. “Maplecroft” was purchased in November 2014. The Fall River Herald News ran this article on early discoveries Kristee made of her renovation endeavors. Lizzie seems to have favored the darker colors, unlike her dining room paper shown below. The house – as a tourist attraction – will have to be furnished with exquisite and tasteful furniture, fixtures, and other appointments that Lizzie herself would have purchased. Such acquisitions will be costly and difficult to find or otherwise acquire, however, will grant great credit to the new owners if achieved. I wish them the best of success in these endeavors and look forward to their progress. Have you ever tried CafePress? I’ve had an account there for years. Check out my stuff and feel free to order something unique for a friend! Click HERE. 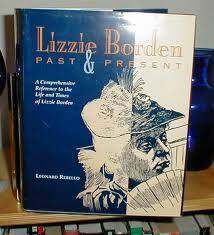 Are you looking for a reasonably priced “Lizzie Borden Past & Present” by Leonard Rebello? Well, here it is on eBay. Click HERE. 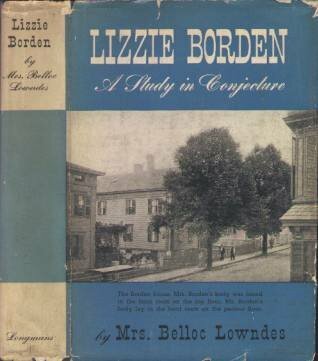 I’ve written about “Lizzie Borden – A Study in Conjecture” by Marie Belloc Lowndes and the much coveted dust jacket. 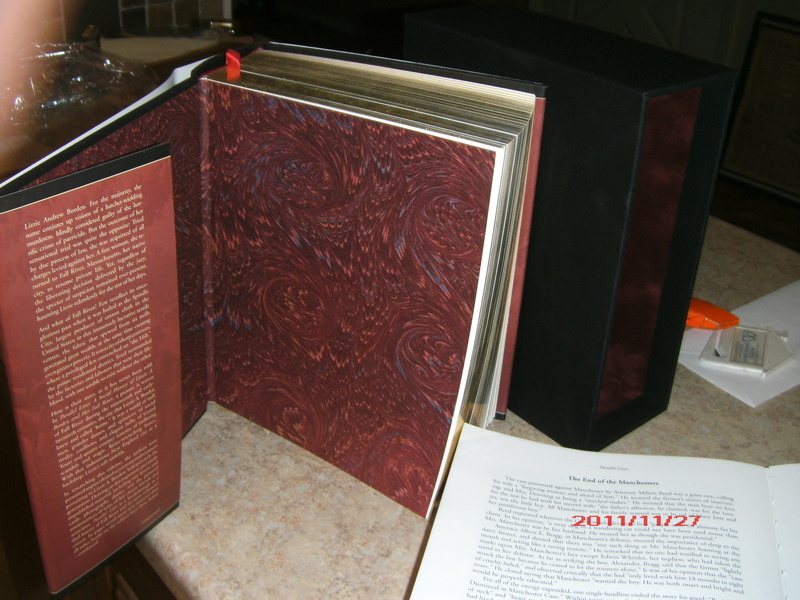 Well, I’m offering the book on eBay at an incredibly low price (usually sells in the hundreds). So here’s your chance. Click HERE. (Recycled post. It’s been a year. Time to remind you how to spend your Christmas $$). 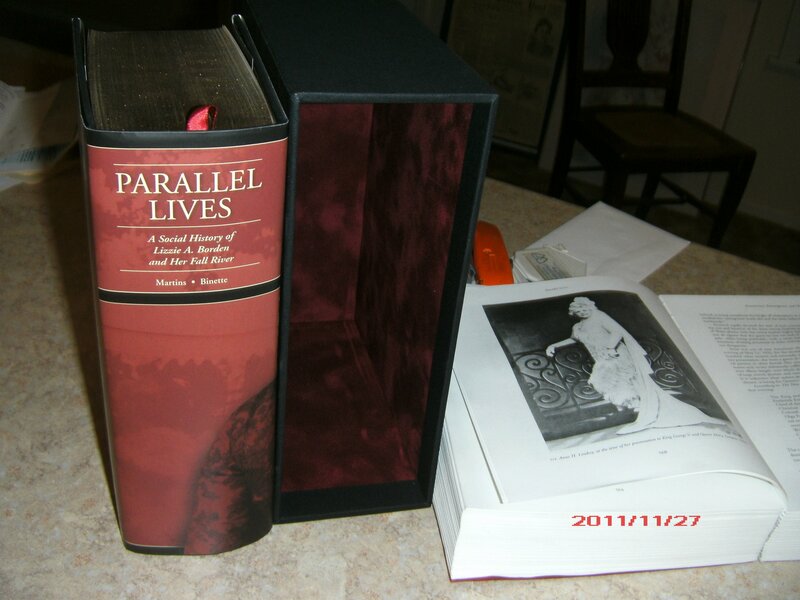 Exquisitely produced, brilliantly structured, thrilling and groundbreaking in its content, Parallel Lives – A Social History of Lizzie A. Borden and Her Fall River is a seven pound, 1,179 page, ten-years- in-the-making epic that had it been written as a historical novel it would be right up there with Roots, The Secret Magdelene, and Gone With The Wind. It is a book of transformation and revelation; transforming in the way it compels readers to alter their mental landscape when thinking of Lizzie Borden. It is filled with stunning revelations that meticulously dissect rumors and legend long thought to be truth. 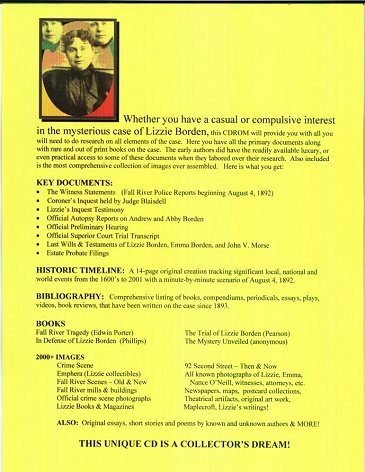 Lizzie Borden has been encapsulated in pop culture based on an inaccurate quatrain characterizing her as a one dimensional psychopath wielding a bloody axe, Parallel Lives has irrevocably transformed and revealed Lizzie Borden to be a three dimensional flesh and blood human being with heart, spirit and soul. 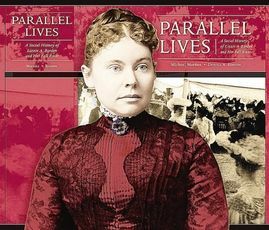 Indisputably, this the new “go to” book which researches and scholars studying the history of Fall River during its rise and decline, as well as the woman Lizzie Borden who lived through that age: 1860-1927, will discover it impossible to find anything more definitive or comprehensive, more exciting or enlightening. 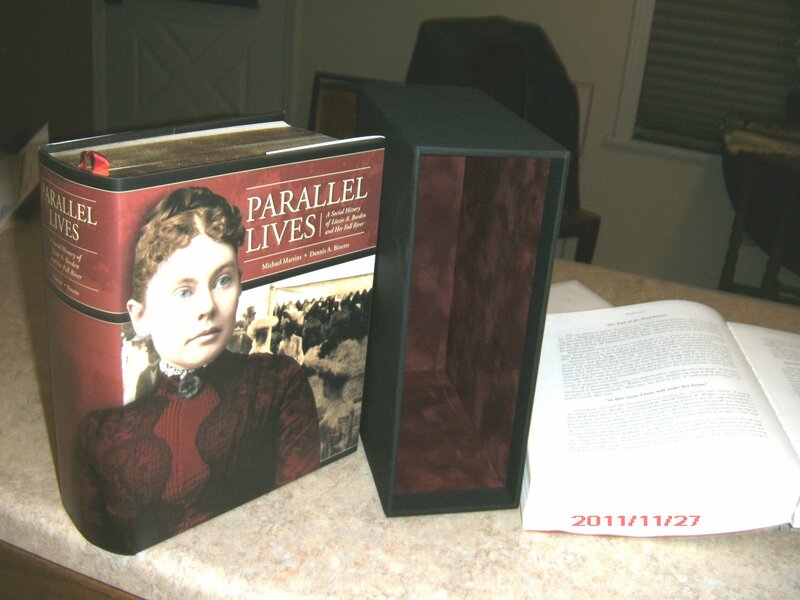 The book is a treasure trove of new information about Lizzie taken from the journals, letters, cards, photographs, artifacts and remembrances of those that knew her personally, much of which was coveted by their owners who were resolved in their belief that Lizzie could not have committed those crimes. Their beliefs were passed down to third and fourth generation descendents who continued to keep their possessions or memories conveyed private and sequestered until trusted relationships were established between them and the authors. 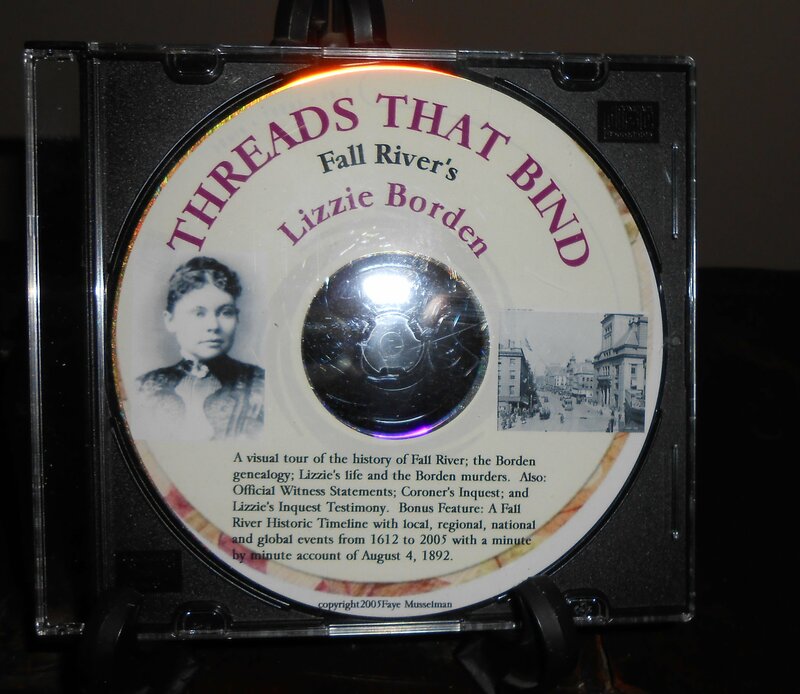 Masterfully woven within the new information are expanded stories of known individuals and events (some prominent, some little or previously unknown) that had an impact on Fall River’s history and society. 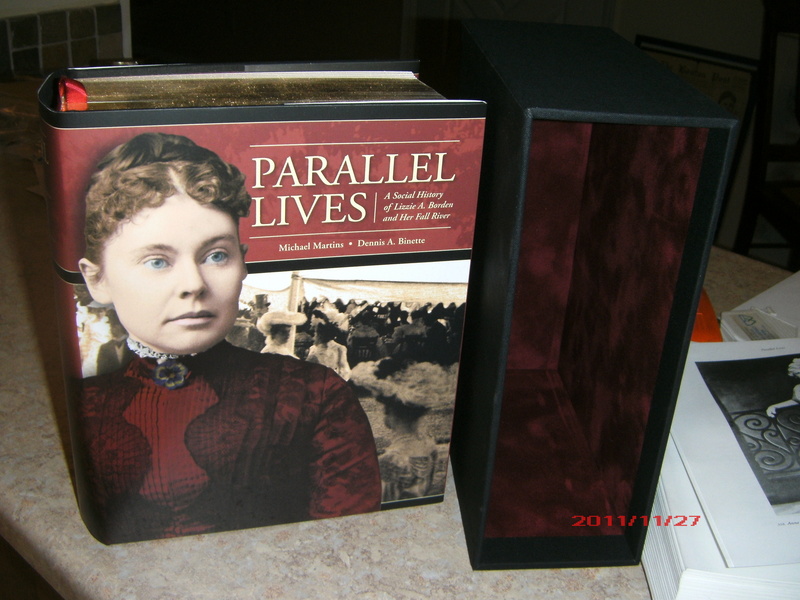 The authors have beautifully crafted the world in which Lizzie Borden lived. And while the crimes of August 4, 1892 are presented, allusions to or fresh insights on whether or not Lizzie was guilty are not presented. In fact, the murders and who did them become almost irrelevant in the broader tapestry presented throughout the chapters with its more than 500 photographs and other images. Who committed the crimes or the case itself, becomes an irrelevancy overshadowed by the depth and breadth of all that which deals with the people and stories within. We learn so much of Mary Ella Sheen (Mrs. George S. Brigham) and her sister, Anne Eliza Sheen (Mrs. William Lindsey, Jr.), two sisters whose lives took very different trajectories. Mary was Lizzie’s friend since girlhood and the future mother-in-law of Florence Cook Brigham, but Anne had been her friend as well for most of their lives. Anne was a “Grand Dame” and lived the kind of life that Lizzie most probably would have wanted for herself. We learn that not only was Helen Hartley Howe such a close and devoted second cousin to Lizzie, we discover that Helen’s mother had a friendship that also was life lasting with Lizzie. The reveal of the true identity of ‘Todd Lunday” would have been anticlimactic had it not been for the intriguing story associated with it, or the story of Officer Phillip Harrington and police reporter Edwin Porter who penned the Fall River Tragedy and why Porter may have left Fall River so soon after its publication. Nor have we read anywhere the connection of reporter McHenry and City Marshall Hilliard. I suspect there are many “reveals” that were derived from the so called “Hilliard Papers” which have been in the Society’s hands for 22 years. For decades, the curators of the FRHS have been meticulous in documenting the “drop in” visits or phone calls from people – many descendents of the principals – as to what they had to say and when. These “notes to file”, so to speak, have been preserved in their respective file folders and filed with the relative topics. These contain more of the “reveals”, some as surprising as finding out JR getting shot was only a dream, or Scarlett realizing she loved Rhett all along, or Edward glistening out of the cloud bank. As stated, the revelations are thrilling and transforming. 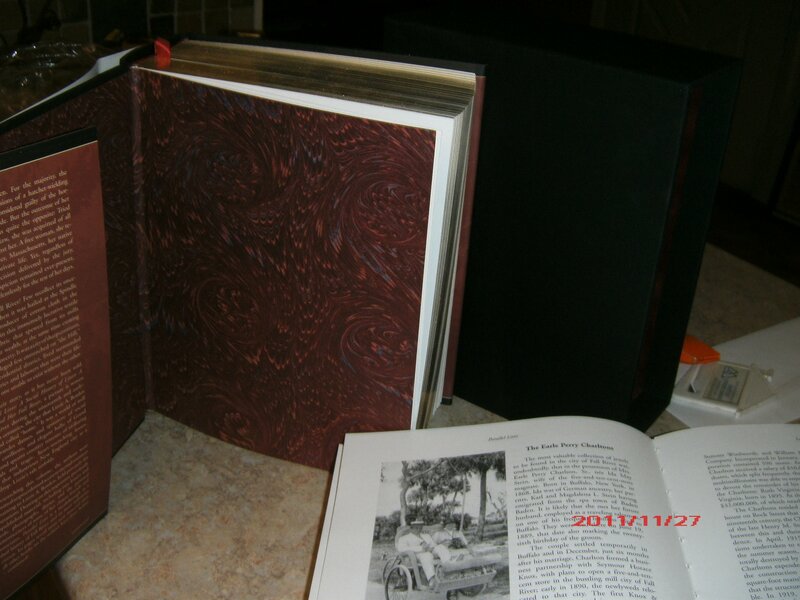 The chapters are so beautifully written and the photographs so beautifully reproduced within the book that we can almost feel the silk and lace as they as we read their wonderfully detailed descriptions. We can rub our finger across the image of a pocket watch and feel the grooved indentations, or one of Lizzie’s traveling suitcases and feel the contrast of the brass to the leather. 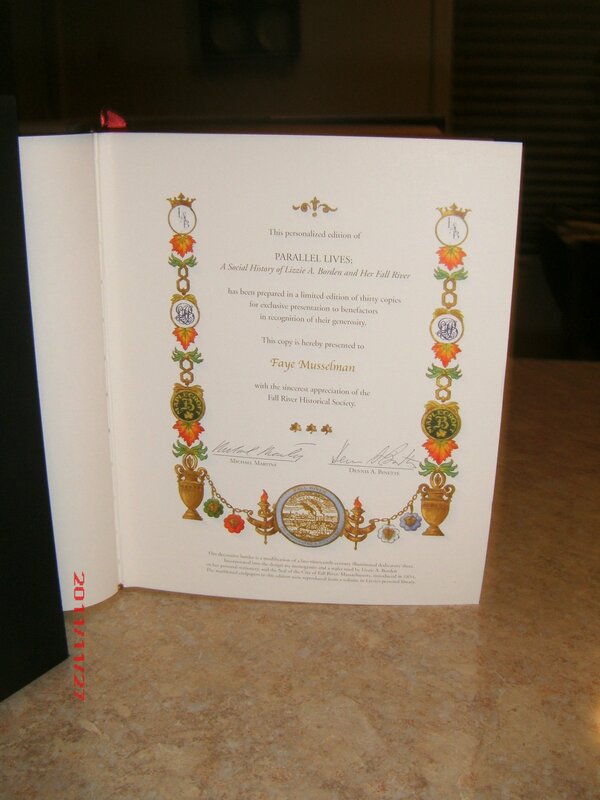 We can smell and see the wedding flowers and the sparkle of jewelry at the Assemblies and grand parties. The meticulous effort in the use of adjectives is remarkable. It is fairly obvious the authors wanted to be as accurate and precise as possible when applying descriptors to people, places and things. I strongly suspect much of what was revealed may have been with soft spoken caveats or perhaps some asserted caveats along the lines of: “Well, you may use these journals (or photos, or letters, or cards, or remembrances) but I trust you will present Auntie Borden (or Lizzie) in a good light because she never could have done those murders.” And “I would consider it a great injustice to finally make this information known if it were used to give a poor impression of this wonderful woman or lend any credibility to the horrible reputation she endured during and after her life.” Mr. Martins and Mr. Binette have stated it was only when they explained the kind of book they were writing, and after trust was established, that the possessions and remembrances were revealed. We learn certain elitist members of the seven “first” families did a fine job in two-facing Lizzie after the Trial; they “cut” her quite severely and most obviously spoke of her “guilt”– handing down their opinions to their children who maintained those opinions and passed them down to their children. On the other hand, those that kept friendships and believed Lizzie was not and could not be guilty passed that info down to their children – or the children knew her first hand and formulated the same opinion; the difference being they did not speak openly about it. They protected her privacy. But between those that cut her and the relentless and continuous newspaper coverage, the damage had been done. The authors were literary craftsmen in the way they told these stories, presenting the information from the journals or letters, and in detailing information about the people involved without trumpeting a new path but sufficient to give you pause. The book is peppered with phrases such as: “Is it possible that…”, or “Although we can never know for certain, could it be that…”, or “Would it seem likely that…” and we pause on the page and hearing ourselves utter “hmmmm” and suddenly realize we are thinking things differently. The End Notes are extraordinary and I found them thrilling to read. When reading, one says: “Where did they get that from?” and we go to the End Notes which are flush with information. Our eyes don’t just stay on the sight bite but naturally scroll downward until we know where most all the information for that chapter came from. The End Notes tell us more about relationships and just who had what information and for how long. The End Notes help us identify what came from FRHS “notes to file” as opposed to who held on to what for decades and allows us to identify from where the bulk of new information came. 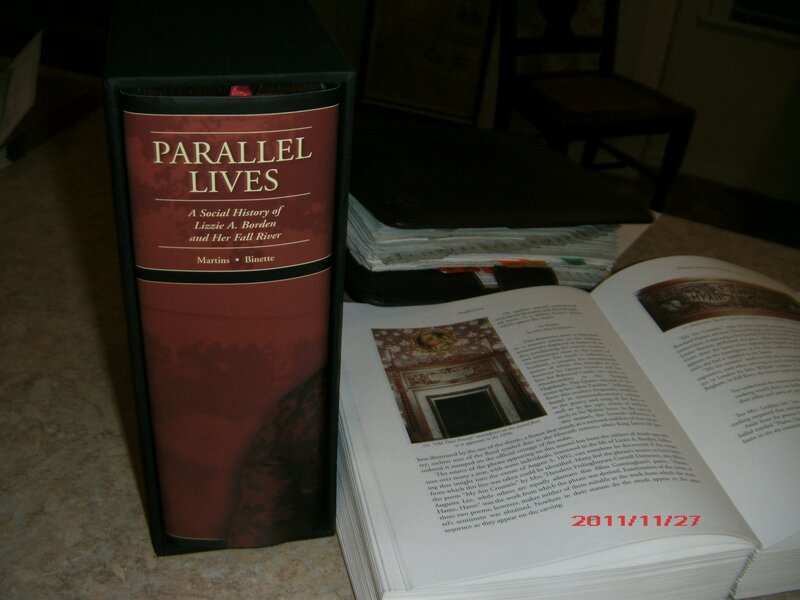 Parallel Lives actually constitutes many books. It is so rich and full it would constitute several Master’s Thesis, multiple biographies, and even separate books on the nefarious acts and scandals in the persons of Mr. Scully and Mr. Barnard, let alone a book on comparative lifestyles of The Hill people and The Mill people. 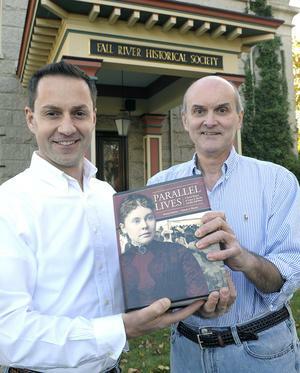 Parallel Lives is a monumental achievement and a body of work to make the entire Fall River Historical Society proud. It is representative of that level of excellence consistent in all endeavors of Messrs. Martins and Binette. It is truly a remarkable and unique work – the likes of which we shall not see again. Rumors died and reality won. The holding sleeve has a leather/felt-like interior. 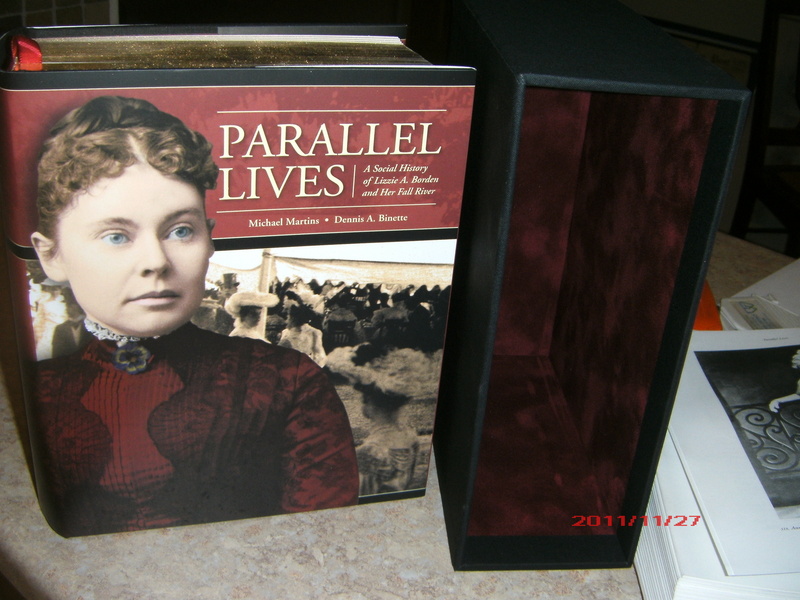 The sleeve has the staged photo of Lizzie in her senior years on the back porch of Maplecroft. The woman that is pictured in the edition already opened (the one I read in Hawaii) is Anne Lindsey, sister of Mary Brigham. What a Dame! 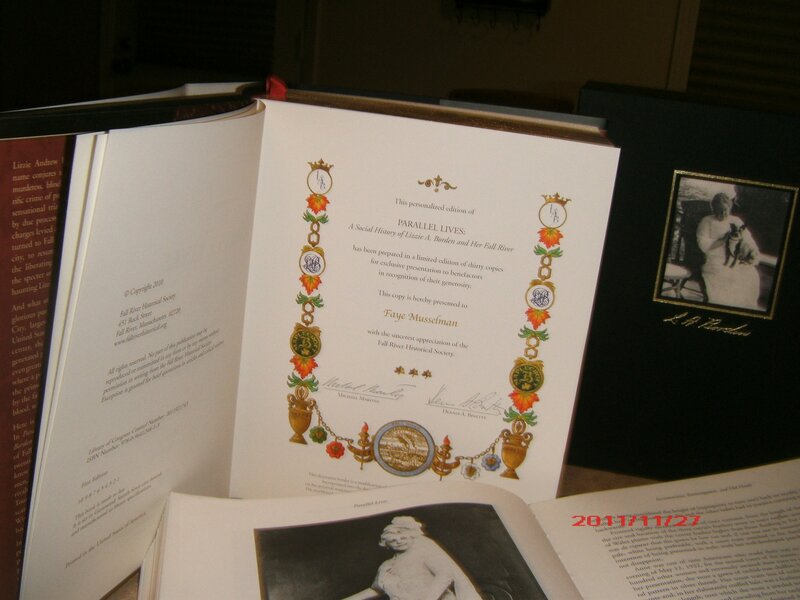 Note the edged gold “gilt” on the pages. The “Presentation” page. Click for larger image. The winner of the free Rebello Book is Lori K. of Dallas, Texas. Lori presented the most convincing argument in an email with a 10 page attachment. Lori has asked I not print or copy other excerpts as she is submitting it as part of a college class project and does not want it on the internet. So, congratulations, Lori and good luck on your paper! 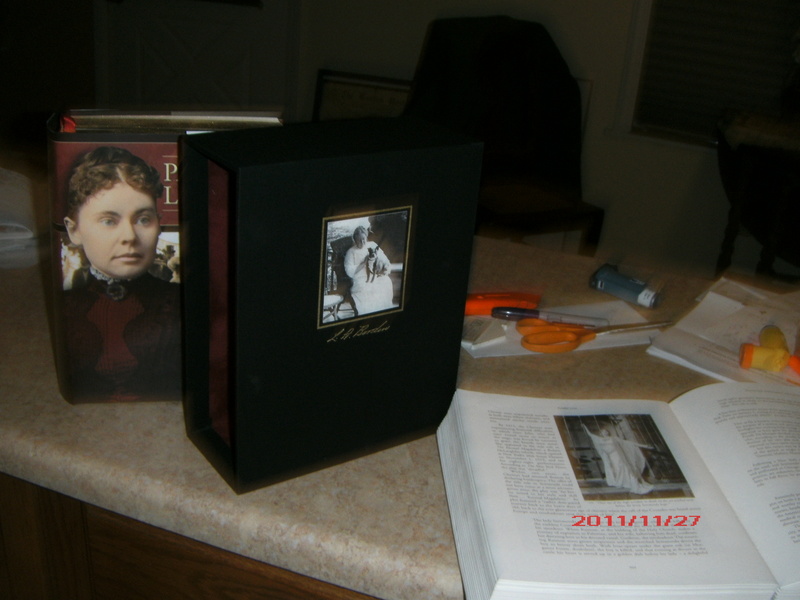 Your “Lizzie Borden Past & Present” will be shipped once you email me with your mailing address. Used copies are available through Amazon and can be viewed HERE. Note I also have one for sale. SECOND PLACE: I’ve decided to acknowledge “E.R.” from Marquette, Michigan who submitted several comments showing good research and sound arguments. 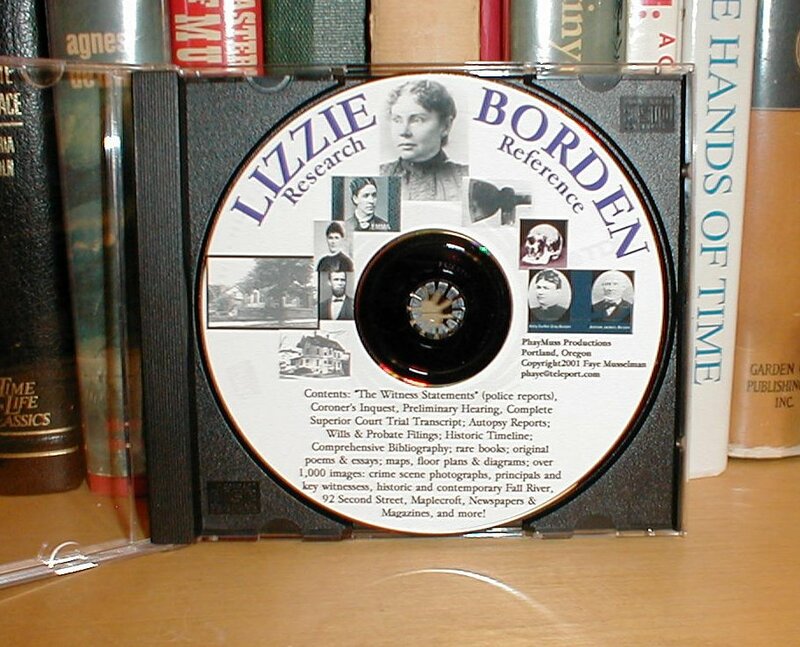 “ER” send me your mailing address and you will receive my Lizzie Borden Research & Reference CD ROM, valued at $25.00. This was so much fun and I enjoy giving away stuff from my collection through these “contests”. So be checking my blog regularly for the nextt one!